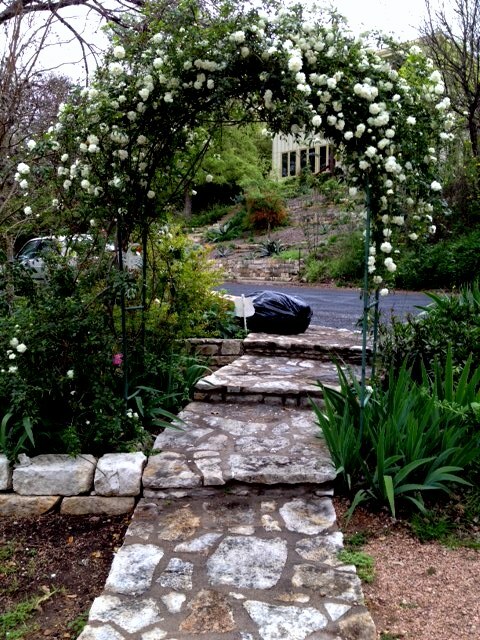 My sister Kamilla’s house in Austin, Texas, March 2012. If you are lucky enough to live in Zone 7 or south, you can grow White Lady Banks [Rosa Banksiae] and Yellow Lady Banks, and this lovely: Rosa fortuniana. It’s thought to be a naturally occurring hybrid between white Lady Banks and Rosa setigera. It was discovered in China in 1850 by Robert Fortune, an enterprising Scotsman who traveled the world looking for new plants. [Many thanks to Antique Rose Emporium <www.antiqueroseemporium.com>, from whom I get all my information and most of my roses]. In Austin, all three of these lovelies grow like weeds. This one was probably planted two or three years before Kamilla took the picture. They bloom for several weeks in the spring with zillion-petaled two-inch flowers that have an old-school knot of petals at the center. They grow in sun or shade and don’t get black spot much or pout and lose their leaves during the dry part of the summer, which is saying a damn lot here in Austin. The Lady Banks roses have smaller half-inch flowers, tiny, really, but they produce thousands of them, so your plant looks like a fuzzy 12-foot-long pipe cleaner in white or a very lovely shade of primrose-yellow. Oh, and they’re all thornless. I found Kam’s Fortuniana mislabeled as White Lady Banks at a local nursery and planted it on the arch along with Climbing Pinkie, which blooms and re-blooms later in the summer. If it were my own house, I’d probably set some clematis to grow up the other side, because it plays well with climbing roses. This entry was posted in rose pictures and tagged design, garden photos, gardening how-tos, Home, old roses, rose how-tos, spaces. Bookmark the permalink. Thanks for the kind words! I had no idea blog was on yahoo news or how to get there — I will check it out. Maybe a thing wordpress automatically does when you hit “publish”? I too think this is a ‘sweet” blog..more more more! One rose I bought in a weak moment at our local ranch store was Crescendo. WOW this beauty starts out as a white bud and turns pink with white edges.BUT this rose keeps it’s blossoms forever! Long single blossoms..I’ve been watching 3 for over a week out my kitchen window.. We’ve had a really wet winter and spring too. (Oregon ..go figure!) Mostly clay soil with a little compost. Pretty nice. I usually go for older roses too. Thanks for the kind words and the info on gardening in Oregon! Are you zone seven or what? What roses work best for you?